Then further along the road has been blocked off and the traffic lights covered, to stop terrorists being able to get near Parliament. Thus traffic can no longer go along down that stretch by the river towards Millbamk - this actually makes the road between the Palace of Westminster and the Abbey rather nice, because for the first time in (??) about 170 years it is free of traffic, and one can walk there and enjoy the glory of the Abbey's Medieval gothic and the Palace's Victorian gothic-revival - there's 1,000 years of history between the two of them as you stand in the middle of the street, and yet they match most gloriously. so I decided to put it on my Blog! Worked with my publisher on lists of people to be invited to the Launch of new book in Oct. Wrote some features for the Catholic Times. (Go on - buy a copy next Sunday. And if you didn't get the current edition, you missed the big pic and full account of my Cycle Ride...). Wrote five talks for Premier Radio, which I'll record next week. Made arrangements to record a new series of Catholic Lives for EWTN, which we're doing in October. Cooked supper. Jamie home and we're going to watch the classic film "I Confess" while I finish my patchwork quilt. Mugs of tea and a fresh apple sponge, warm from the oven. If you don't know about the story, you can get the basics from this link, and there is lots more on the Internet both in English and in German, but I'm keen to write a booklet about him and get, for example, the CTS to publish it. Bishop von Galen became known for his courageous sermons against the horrible Nazi euthanasia campaign - but of equal interest are his denunciations of the history books that children were being made to use in school, which sneered at the Church and the role of Christianity in history, and his concern at the immoral messages they were getting from various official youth schemes. He urged parents to counter this by teaching the Faith at home and remaining loyal to the Church. Er...if this begins to sound familiar, then you will see why I think his life and work have a message for today. At the weekend we bought some chairs - from where everyone locally gets good second-hand things, which is Missionary Mart. They have stacks and stacks of furniture - some of it absolutely horrible, some rather nice - and are jolly and friendly. The money goes to various (Evangelical) charities. There are lots of dining-room tables and chairs, and indeed kitchen tables too, at the moment, because families don't eat all-together-round-the-table much any more, so they get rid of the relevant furniture. Which seems a bit bleak. ...and as I pushed my bike up Sutton High street on Friday night, a group of girls were shrieking obscenities and laughter in response to some anecdote told by the largest and fattest: "Yeah, so I told him to f...off, yeah?" etc etc. The mating rituals are rather sad: the boys it in a solemn row at the bottom end of the litter-strewn shopping centre, looking glum, with their trousers sagging down to their knees, and puff cigarettes and drink out of cans and burp, and the girls sort of shriek around the edges and kick bottles and cans about, and leer and are very loud. One couple had made a connection and were groping together in a rather embarrassing way on the steps of the war memorial while others shrieked on the roof of a nearby shop. These last stepped up their noise as I approached, and I think they wanterd me to tell them they were trespassing and doing malicious damage - which they were - but over the past few weeks two or three people have been stabbed to death trying to remonstrate with youth, so one tends just to leave them to it. If I am to meet a violent end - with which I've been threatened a couple of times - then I'd rather do it when I'm in a calm and ordered state of mind, not when I'm annoyed. As I passed the war memorial I felt sad about all the men whose names are listed there. New bulletins dominated by accounts of the child shot in Liverpool, latest in a series of public killings of children by teenagers. Perhaps now it will be admitted that public order, the punishment of crime, and safety under the law, should be among the priorities of our rulers, rather than banning hunting, imprisoning good parents who smack naughty offspring, and promoting lesbianism and homosexual activity. But don't hold your breath. I love giving talks about this topic: to women's organisations, church groups, Confirmation classes, schools, colleges, Parent Teacher evenings, you name it. Send a COMMENT to this Blog, with an email address at which I can contact you (and please remember that if you fail to give me an email address, I have no means of reaching you) if you can think of any group that might like to invite me as a speaker. ...is glorious on a breezy summer's day, with bright sunshine after rain, and huge blue skies, and the Somerset levels stretching out beneath us as we climbed. 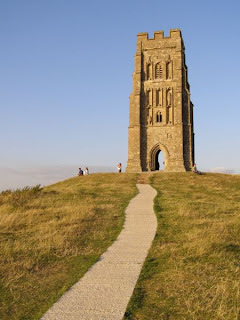 The Tor is a tall hill, dominating the skyline of Glastonbury. Pilgrims come here, and have done for centuries. It's a place of mystery, and of faith. Legend says that Joseph of Arimithea came here, when the small band of Christ's first followers left the Holy Land to spread the Faith everywhere after Pentecost. He planted his staff in the soil and after a time it took root, and grew - and certainly today a bush of Glastonbury Thorn, native to the Middle East, grows in the grounds of Glastonbury Abbey. There's more to the legend, too - some say that Christ himself came here, and stayed for a season, while on a trading trip with his uncle, during those "hidden years" of his early adult life before he started his public ministry and was working as a carpenter in Nazareth. This is the origin of the idea behind Blake's "Jerusalem": "And did those feet, in ancient time, walk upon England's mountains green..."
We drove home via other friends whose enchanting baby was toddling slowly across the room with deliberate steps and beaming at his achievement, and who loaded us with fresh eggs from their hens, and beautiful damsons from a plum tree groaning with fruit. ...not just complaining. Have you written to Rome yet about the disgraceful nonense produced by "Caritas Social Concern", an agency of our Bishops' Conference? Scroll down through this blog to get information. A young friend alerted me to the needs of Christians in Iraq and there is useful information on this at this blog. A donation to Aid to the Church in Need (1 Tiomes Square, Sutton, Surrey SM1) wouldn't go amiss either - they are currently trying to help Christians there. The Christian Institute website has a lot of useful material on parents rights and talks a lot of common sense. There is a worrying possibility of a new law which would criminalise good parents - go on, look it up, and write to your MP. Look up their new YouTube on religious freedom, too. Until the Daily Telegraph made me think about it, I hadn't honestly given any thought at all to the plight of our soldiers in Afghanistan. They are doing a desperately difficult job, in vile heat and in the knowledge that few people at home care at all about it. Over 80 per cent of the heroin that our drug addicts use in Britain currently comes from Afghanistan: there is a pious hope that at some stage a sane government there might help to stamp out this nasty trade and in theory our Army is there to help bring forward that day...meanwhile the drug culture here continues to create the demand which Afghanis and others will naturally supply...what a mess. Our soldiers' bravery deserves your thanks and mine: it hadn't even occurred to me to think of them in my prayers. What about you? The Telegraph is urging the soldiers' valour to be marked with a proper campaign medal - before you sneer that this is an irrelevance, find out what soldiers think about it. One died the other day, heroically refusing morphine because he wanted to be alert to help get his men to safety. 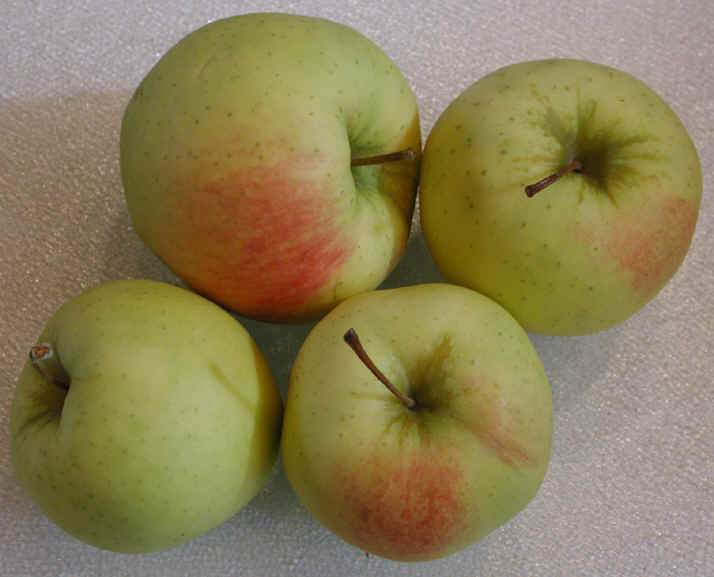 ...which is slightly uncomfortable as they are usually associated with Autumn. What's happening to our seasons? 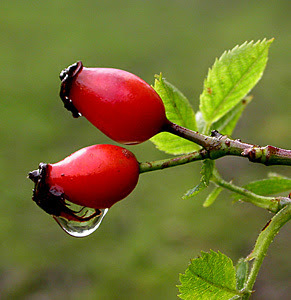 I paused to gather a huge bowl of rosehips on my way to Mother's, then made them into syrup while I was there. I wasn't quite sure how to do this: I put the berries in a saucepan with cold water, stewed them for a good while, added more water from time to time as they seemed to soak it up. Then poured the lot through a sieve, crushing the berries with a wooden spoon as I did so. Ditched the mess left in the sieve, added sugar to the liquid which had strained through, and brought it to boiling point and let it simmer a bit...decanted it into jars and put some in a bowl. M. and I both had a spoonful...it was absolutely delicious! Will use it on pancakes, or poured over ice-cream. ...at the Chinese Embassy in London. Well done. ...life has been busy. Yesterday a young relative arrived to stay overnight, so as to be in London early today for a human-rights demonstration outside the Chinese Embassy. (I hope they get some publicity - if you see anything, send info to this Blog). The post brings the excellent new catalogue from Family Publications - as always, so many books I'd love to get. Some while back, a correspondent to this Blog asked for information on any good material teaching children the Catholic Faith. The Faith and Life Series, available from Family Publications, looks very good indeed. Also info in the post about the conference to be held by the Society for the Protection of Unborn Children on Sept 7th-9th at Leeds - speakers include Nicole Parker of Central London Fertility Care , and Sister Roseann Reddy of the Sisters of the Gospel of Life, who runs Cardinal Winning's Pro Life Initiative. ...so I thought I'd put a pic of him on my blog. Hurrah for our dear Holy Father - and if you haven't yet read his book Jesus of Nazareth, go out quickly and either buy a copy (it's not expensive) or order one at your local library. (You do this by simply asking for it, and if neccessary filling in a card - you may have to pay about 50p, but for goodness' sake, it's worth it. Ordering a copy in this way ensures that not only will they get a copy for you, but it will then later be on the shelves for others. Go on. Do it today). The book really makes you think about who Christ was, and who he claimed to be, and why we still number our years after his birth, and why it all matters, and why it's no use simply trying to dismiss him with cliches. 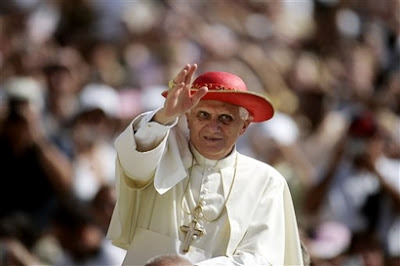 I must add something absurd: if you Google for " Catholic Pope Benedict images" you get - among lots of other images - a pic of apples and one of blackberries, taken from this Blog! Which just goes to show that the Internet has its daft side too. It's crucial to take the right action about this. First, don't make silly comments about there being no decent priests in Britain: that's rubbish. I know a number of superb, dedicated and rather holy priests, and of these there are several who would make excellent bishops. They are (in no particular order of importance) intelligent, capable, prayerful, well-read, fluent in two or three languages, knowledgeable about the Church and the world, close to Christ, warm-hearted, and lead good lives. From these men could come the bishops of the future. Why not pray about this? Second: write to the Congregation for the Doctrine of the Faith in Rome about the appalling booklet produced by "Caritas Social Concern". (The CDF's address: Piazza d. S. Uffizio 11, Rome 00193 Italy. Put on two normal second-class stamps and the letter will get there. Do it today). Three: your own Bishop needs to know about this Write to him. Be respectful of his office, and fair, and thank him for the fact that he is dedicating his life in service to God and the Church. He probably doesn't know anything about the rubbish being produced by "Caritas Social Concern" in his name. You are there to inform him and to ask his help and getting something done. Bear in mind that "Caritas" will probably try to suggest that anyone who writes is ill-informed, bigoted, uncaring about the plight of the poor, or lying. Ensure that your letter conveys the fact that you are none of these. Four: If/when you get any replies, inform me or other Catholic bloggers about them, so that we can get a proper action going about this. Five: DON'T just say "oh, isn't it terrible...nothing we can do...state of the Church...oh, I remember when...so different today...dreadful...guitars...can't abide..." and then do none of the things I have suggested. ...is of course not really a cheese at all, but a delicious blend of apple-and-blackberry, carefully cooked and pureed with sugar, and sealed into jars for enjoyment and relish. It is delicious on buttered toast, or with cold ham or cheese as an alternative to pickles. Apples are beginning to ripen now in suburban gardens, and our next-door neighbour allows me to gather some of hers, in return for some of the resulting jams and jellies. In fact I give some to all the neighbours (we have people on all sides, and upstairs, and everyone helps by collecting jam-jars all year). As I write this, a great cooked panful of blackberries is also slowly dripping through a jelly-bag in our kitchen, to be turned into glowing bramble-jelly by the end of the day. ...So why not go out blackberrying yourself? Especially if you are a blogger-addict. It's summer, get out of doors! Then, while the jelly drips, or the blackberry-and-apple pie is baking, you can write to the Bishop (see previous blog entry, below). BTW, please DON'T send me a Comment about the matter below unless you have already written to the Bishop concerned, or to your own Bishop, about it. There's no point. I feel every bit as indignant as you do. The question is: what are you going to do about it? What on earth do the Bishops think they're doing? 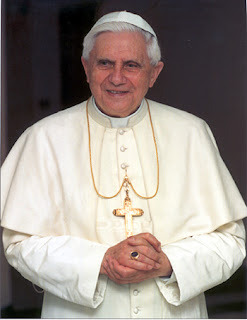 ...by sponsoring the publication of a book underming and attacking the Holy Father's encyclical Deus Charitas Est? See Damian Thompson's report on the Daily Telegraph blog. The book is produced by something called "Caritas - social action" which announces itself smugly in the Catholic Directory as "the voice of the Catholic church on social justice and care in England and Wales" and "an agency of the Bishops' Conference" seeking to "influence Government policy and advocate for a more just society." Difficult to see how social justice and care in E and W are enhanced by using the funds of churchgoers for a book denouncing "the ideology of the nuclear family" and endorsing "the open family ideology rooted in a feminist perspective". Oh, and using inverted commas around the word "terrorist" when describing the 9/11 attack on New York. And saying that the Holy Father's encyclical reveals him as taking a stance in favour of "the capitalist system and colonialism." It is possible that Bishop Budd would like to have the views of faithful Catholics, whose money is being used for this nasty rubbish. He is Bishop of Plymouth. 34 Barnard Gardens New Malden Surrey KT3 6QG. St Pius X is the next parish along from St Joseph's, New Malden, and Fr Dominic Allain, who is the parish priest there, is in charge of the local young people who are hoping to go to World Youth Day. The Cycle Ride - I made it!! ... and have brought back some pebbles from Brighton beach to prove it! The Sussex countryside on an August evening was beautiful as I left West Grinstead and headed through Partridge Green , then past fields and woods to Cowfold and Bolney. 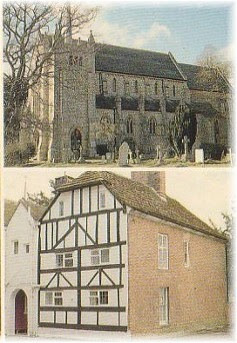 I stopped briefly at Parkminster - the great Carthusian monastery of St Hugh, standing alone and silent up a driveway. No one was about, but you can peep through a window-slot in the great door to an inner courtyward with immaculate lawns leading to a great church. But traffic roared terrifyingly along the lanes and roads, making life very difficult for the cyclist. I can quite see why most parents do not dream of allowing children to go about freely on their bikes or on foot- a restriction unknown to previous generations...it was bliss to arrive at the lovely farmhouse of friends near the village of Ansty and to be made welcome with cool drinks...I used up a lot of my kind hostess' heavenly lavender-scented bath salts and then we were sitting down to a chicken supper and swapping news and talk. G. and A. are old friends whom we first came to know through G's wonderful help with the International Congress for the Family back in 1990 - which coincidentally was held in Brighton (and, goodness, how prophetic it was in its call for a restoration of the rights and values of the family based on lifelong male/female marriage). The next morning, after much consultation of maps, I was off to Brighton. It was delightful until I was forced to use the main road. I couldn't locate any cycle track - with relief I saw a sign marked "Equestrian route" and felt that, where a horse could go, a bike might too. This was great for a while, but then veered off up to the South Downs, whereas I needed to keep on to Brighton. It was horrible, in terrific heat, trying to keep safely up against the verge and away from the great trucks and lorries thundering past. Eventually, there was a turning where I pulled off, and while I was resting a rider came by: we hailed each other with the sort of vague solidarity that cyclists and riders have, and she told me there was a cycle track that began just across the bridge:"follow the pink track, all the way to Patcham". I did as I was told and I was soon on my way to the coast. I was late arriving at St Joseph's, and midday Mass was just ending, but at the church door a lady greeted me with "Congratulations! You've arrived!" and in the cool church I was welcomed with evident relief by some kind people and was soon chatting to them and to Father Paul Williams, chaplain to Sussex University, who had just said Mass. I wanted some something formal to show my sponsors, so he wrote on a parish newsletter: " Joanna Bogle arrived safely, if hot, at 1.00pm on Tuesday 7th August." The parish at New Malden had planned this Pilgrimage to coincide with my arrival at the Shrine and to celebrate the Feast of the Trasnfiguration. We had Benediction in the beautiful shrine church, with Father Peter and our Deacon John, and a most interesting talk about the shrine by the priest in charge, Father David Goddard. There is a hidden chapel in the attic of the priest's house, where priests celebrated Mass in the days of persecution, and a priest-hide where they could go if the house was searched. The magnificent shrine church dates of course from a later period and was begun by a French emigre priest who, in an extraordinary turn of events, was here as a refugee from France when the Church there was facing its in time of danger. In due course there were all sorts of things here, including an orphanage and even the beginnings of a small seminary. It was a beautiful afternoon. 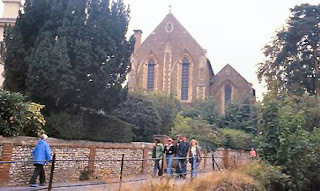 Groups went up the twisting stairs to the little chapel, while others explored the lovely Rosary Way in the garden. Father David is a former Anglican, and married, and his wife took the groups up to the chapel and told its story. There are so many layers of history here. The land was owned by the Carryl family, staunch supporters of the Old Faith, and when they were driven out after years of fines and persecution, they finally went to America: a member of the family, Bishop John Carroll, was the first Bishop of Baltimore. I was given a grand farewell by Father Peter, Father David, and Deacon John (who took pics - some will appear on this blog in due course) as the parish group departed for home...as I set off down the lane the scent of the lavender I had gathered in the churchyard wafted up from my bicycle-basket, and there were birds chirruping, and I had Father David's final instructions in my head:"Straight to Partridge Green, and then turn left there and down the lane..." I followed his directions and was soon on my route to Ansty, past fields all golden with the harvest. 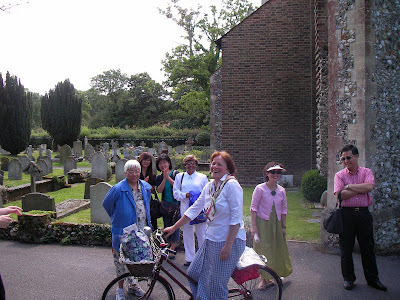 ...shows my departure from New Malden, with Fr Peter Edwards and supporters (you can see our little parish shrine to Our Lady just behind me). ...is a pleasant Sussex town, and I'm writing this in the public library! It was a glorious ride in good sunshine, and I stopped in Epsom, past the Spread Eagle where I remember going for lunch years ago with my mother and grandmother - it's now a smart clothes shop! - then past a bustling Sunday market with rather nice foods on sale, then the Assembly Rooms, doing a good trade in Sunday brunches...and so to St Joseph's church, where the last Mass of the morning was just finishing. Vast modern church - I've been here before to give talks at Family Days and Confirmation groups. I was HOT and the cloakroom was beautifully cool and air-conditioned! Into the church for the end of Mass - they had "Soul of my Saviour" at Communion which is one of my favourite hymns.... A friendly Polish priest who had just come from Africa, and was thanking the parish for its support of his work there...he greeted people as they emerged, and I got some one in the parish office to sign a piece of paper saying I'd been there (I'll put that on my Blog in due course just to prove it to you!) and then I was sitting down with the parish priest and gulping lots of water and chatting...duly refreshed I set off again, and the next stretch of the journey became steadily more rural, green fields and cool shady woods. I got away from main roads as much as I could, cycled through Leatherhead (still a pretty town, and largely unspoiled by slabs of concrete) and off towards Mickleham. It got extremely hot as the afternoon began, so I turned off at Westhumble, remembering a little ruined chapel there which I thought might be worth visiting. I rested agreeably in the shade next to a dear little St Michael's Church ("Prayer Book services: 8am Communion first Sunday of the Month. Prayer Book Mattins 11 am Third Sunday in the month"). Some hikers went by asking for directions and on looking at their guide-book I realised that the ruined chapel was the predecessor of this small church, so cycled off and found it. Wrecked by Henry V11, just one main wall and some stumps still standing, in a cool green lush corner. I scrambled over a wall and knelt and prayed...it would be simply lovely to have Mass here...could easily be arranged, the place belongs to the National Trust, you could put a table up against the wall and just have Mass on it, where the altar presumably stood 400 years ago...the chapel was dedicated to St Michael - is this the origin of Mickleham?? Off again and it was very hot on the final lap. Stopped in Dorking, freshened up and ate a late-lunch snack, then took off again. ...on my sponsored cycle ride, tomorrow morning. Parish Mass at St Joseph's, New Malden, at 9.30 am, and as it ends I depart in style, with Father Peter blessing me and my bike, and pictures of the Holy Father being distributed, and (I hope!) a general feeling of parish solidarity as I head off down the Kingston Road towards The Fountain and thence southward...heading for the coast, and Brighton! It is rather nice that I am going from St Joseph's in New Malden to St Joseph's Brighton, via St Joseph's in Dorking - might also manage to drop in at St Joseph's in Epsom! And the Pope's name is Joseph. So it all fits nicely together, to raise funds for young people to go to World Youth Day. First overnight stop will be with friends near Dorking (see above). The Catholic Times has a nice mention of my Ride this week. Weather is HOT. We spent today working in the garden, long overdue tidy-up. Everything is scented with rosemary as we have been trimming the big rosemary bushed that are overgrown both at the front and the back of the house, and carrying armfuls of the gloriously aromatic branches. We broke for a garden lucnh, with a big blackberry pie, berries just gathered an hour earlier from my favourite local spot. Nephew E. is staying to help us with a computer problem. I packed for tomorrow: a couple of changes of clothes, overnight things, water to drink, some money, my rosary. A couple of evenings this week have been spent at the annual Summer Session of the Faith Movement, in the lovely surroundings of Woldingham School. Biggest-ever such event, crowds and crowds of cheerful young people, groups chatting in the lovely grounds, sense of energy and activity, sound of young voices praying together. I arrived in time to hear a sparkling talk from Sister Roseanne Reddy of the Sisters of the Gospel of Life - powerful, inspiring, amusing, challenging. This is a new religious order, based in Glasgow and emerging from Cardinal Winning's Pro Life Initiative, and doing good work with women and babies in a spirit of great goodwill and generosity. Sister Roseanne always arrives with a crowd of enthusiastic young Scots who have given their own distinctive stamp to the whole Faith Movement - yesterday evening saw a splendid ceilidh, a vast improvement on the traditional disco. Here, the dancing was lively and continued non-stop until late: a really delightful sight with people quickly getting a grasp of the dance and twirling partners and forming circles and jiggling round the room in terrific style to traditional Scottish music. It was a joy to watch. Sister Roseanne and Sister Andrea look great in their religious habits, though I sometimes spare a thought for the vision allegedly first discussed at one of the early gatherings of interested young women: tartan veils! For Jamie and me, it was a time to meet old friends - the talk and laughter greeted us as we approached the (beautiful, ??? vaguely Jacoebean-style) school building with its wide steps leading down to the lawn. In the evening cool children ran about and their giggles and shrieks made a background to the adult chatter - a nice feature of the Faith Movement is the arrival at this summer gathering of young couples who met through the movement and now return with their families for this agreeable get-together. An even more noticeable feature is the large numbers of priests who arrive here - men whose vocation has been directly or indirectly formed with and through the Faith movement, now active in parishes across Britain. And among the young people taking part, an even larger number this year seemed to be training for the priesthood, or just off to the seminary this Autumn. We stayed until much too late - Jamie had joined in the dancing and both of us were also hugely enjoying the company of young relatives among the attendees. As we left, people were wishing me well for the Sponsored Cycle Ride. One young cycling enthusasist assured me that I ought to be able to do 20 miles in about two and a half hours. Hmmmm. Bulletin arrives from the National Association of Catholic Families. A good read, as always: news of a retreat planned by NACF Youth for October, local groups running Family Days with guest speakers and opportunities for families to get together, a team going to World Youth Day...a report on the annual pilgrimage to Walsingham which was held on one of the wettest weekends of the year, a stream overflowing into the river where the families were camping, tents blown down, a Force 8 gale...and the Psalm at Mass on the final morning was "So let the good man pray to you in time of need. The floods of water may reach high but him they shall not reach. You are my hiding place, O Lord"...!